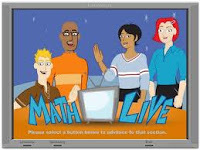 MathLive is an educationally-sound, completely full-featured online tool that can help introduce math concepts and encourage problem-solving skills. Each video-based episode includes an animated overview of a math topic, interactive tools, teacher notes, activity sheets, and assessments. Created for educators in Alberta, MathLive is entirely free (there's no "premium" content or ads encouraging "upgrades). The videos use Flash technology, so this site isn't accessible on iPads, but it is ideal for use with classroom projectors and interactive whiteboards.